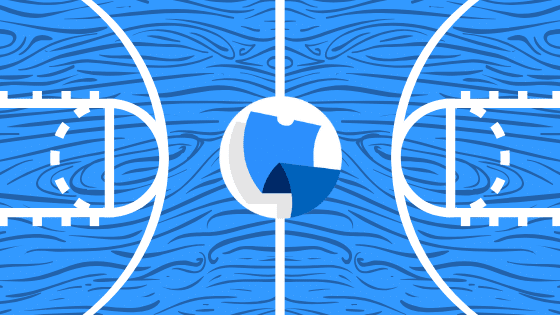 Welcome to TickPick’s Indiana Pacers Seating Chart. Here we will cover everything you need to know before purchasing Cheap Indiana Pacers Tickets or concert tickets for this venue, including Bankers Life Fieldhouse seat numbers, team bench locations, club seats, and more. Please find detailed information on the Pacers Seating Chart at Bankers Life Fieldhouse. 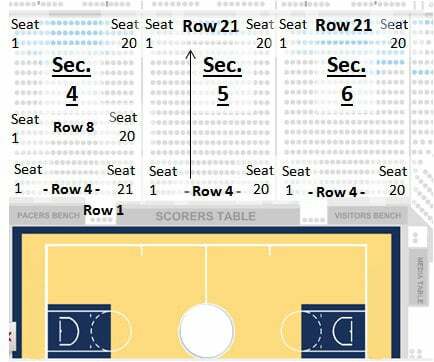 Use the interactive Indiana Pacers Seating Chart below to see row numbers (just hover over the section). The seat numbers in the Bankers Life Fieldhouse start with 1 and typically go to 20. Seat 1 being on the aisle towards the section next to it with the lower section number and the higher seat number going towards the section with a higher section number. For example seat number 1 in section 4 is next to seat number 19 in section 3 and seat number 20 of section 4 is next to seat number 1 of section 5. The Indiana Pacers bench is directly in front of section 4, row 4. There is no row 2 or 3, however there is a row 1 with 4 seats right next to the bench which starts with seat number 18 and goes to seat 21 which is next to the score table. The visitors bench is directly in front of section 6, row 4 and there are is no row 2 or 3. Similar to the Pacers bench there are four seats in row 1 next to the visitor bench starting with seat number 4, while seat number 1 is next to the score table. The Pacers Court side seats can be found in sections 1 thru 20 and are the first 8 rows of each section. However, when looking to see what the difference from row 8 to row 9 is, beside the price, we were not able to find any information as to what’s different. Therefore it’s our recommendation to check out TickPick’s deal finder and algorithms to help you decide which seats are the best bang for your buck. 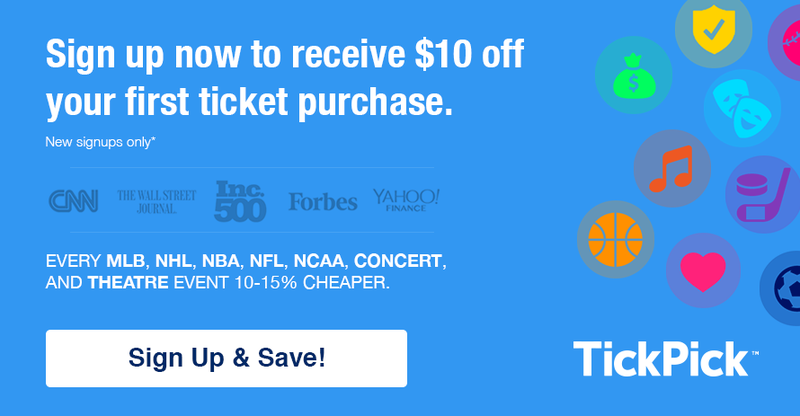 Just search the Indiana Pacers tickets and select the game you are interested in. You’ll see tickets are listed by a score report (which is a grade rating system based on the ticket price and seat location). The Club Seasts towards the center court (sections 103-105 and 116-118) have 8 seats per a row. These rows are split into two groups of 4 seats. By looking at the Pacers seating chart above you can see which other Club sections have a break within the section such as section 102, 106, 115 and 119. Every section within the 100s is considered a club seat, including the corner sections between 107 to 114 which have as many as 15 seats per a row. The 100s sections towards the center court, have 8 seats per a row. Most of the rows are split into two groups of 4 seats. The corner sections may have as many as 15 seats per a row. In the 200s the center sections (208, 209, 224 and 225) have 24 seats per a row while the sections next to them (207, 210, 223 and 226) have 26 seats per a row. Note: Although seating charts are not drawn to exact scale the sections and parts of sections that appear smaller or have certain shapes where the lower part of the section looks smaller than the top part of the section does reflect the amount of seat numbers per a row. For example the first row of section 227 has 6 seats, then the 3rd row only has three seats, the 7th row seven seats and each row increases up until the 19th row which has 28 seats. To see a 360 degree virtual tour of the Indiana Pacers seating, click here. Our only complaint of this 3d interactive Pacers seating chart is that the images aren’t real pictures, instead they are computer generated, however it sill does a good job in helping you decide which Pacers tickets to buy.